At the M.I.V.W event last month, I was invited by Oliver Verheij to attend the VW Fanatics show that he helped organize. The show was held on a field adjacent to a large lake, making it feel like the Dutch Wörthersee. It was a really nice event with a laidback feel thanks to the music in the background and the people that attended the show. Too bad the weather was against us but that is something you can't control. 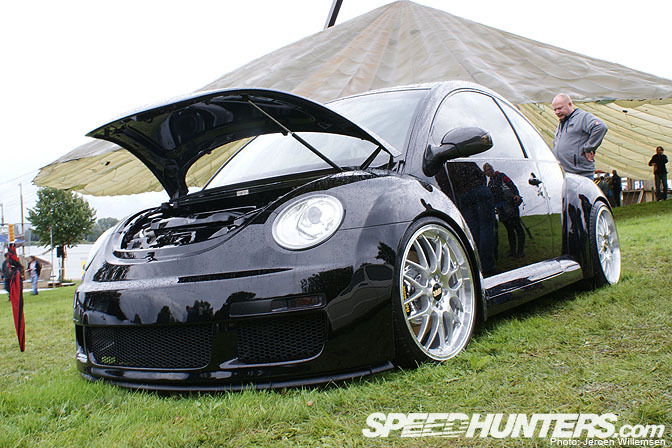 This new Beetle looked quite menacing with it's 20 inch BBS wheels and drop thanks to H&R. Behind the massive wheels are a set of AP Racing brakes. I always love these beige colors on Volkswagens. The smoked taillights and custom rear view mirrors are a nice touch. Here is a trend I see slowly dying, rusted panels on cars. I must admit I did like it on this car with its bright orange wheels. One of the few new Sciroccos I saw at the show. Behind the chrome front wheels are a set of Audi S3 brakes. 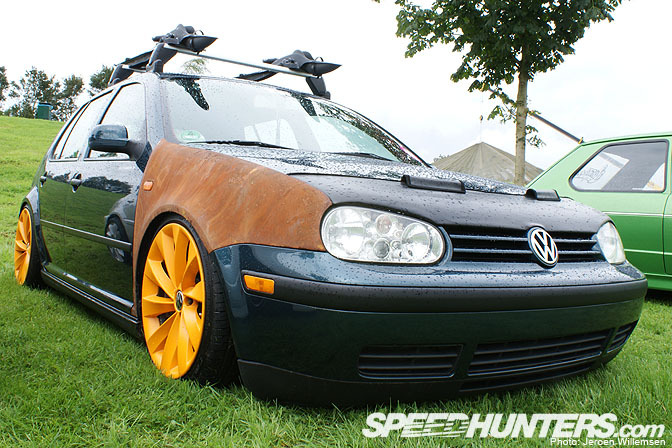 This Volkswagen Passat or ‘us-limo' had a set of Porsche wheels and was dropped with the help of airbags. 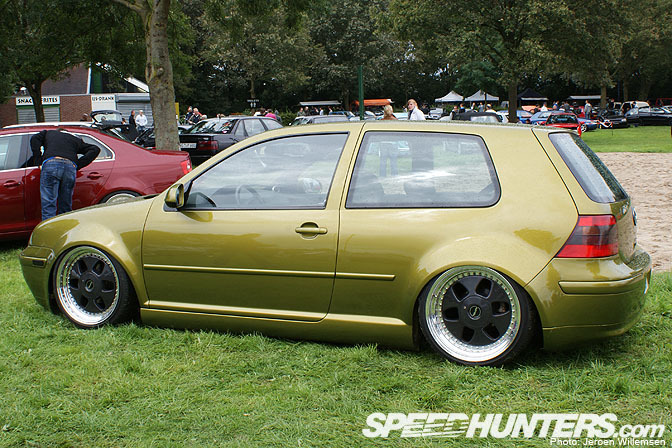 A few years in the making and never to be the same again was this MKIV Golf with a Bora front and MAE wheels. The fenders had been modified to make the wheels fit. The centers of the wheels had a carbon finish. The green MKII from the opening shot had a Golf Rallye front and chrome Schmidt wheels. This orange MKI belonged to the same crew and was a real eye catcher despite the rain. I loved the overall finish of this car, it was spotless. 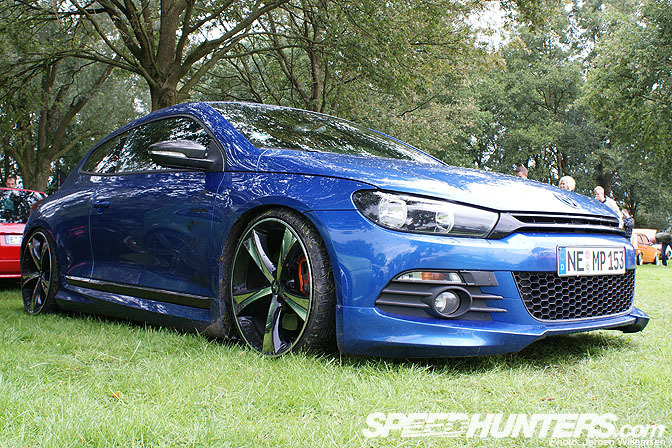 This MKV GTI looked stunning with its wheels ‘borrowed' from the Mercedes Exelero. 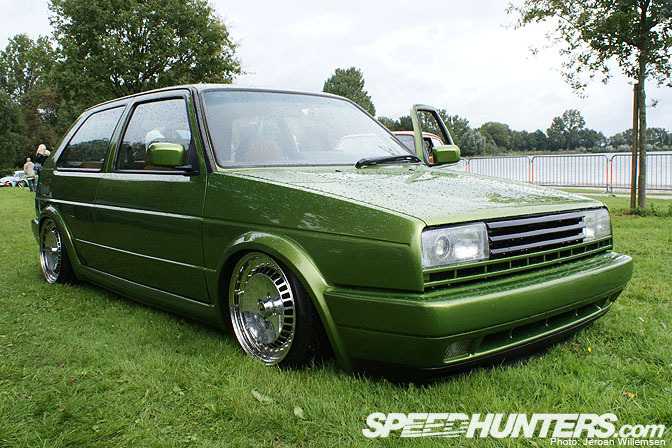 A MKI Caddy is something you don't see very much, especially not this good looking. The bed in the back was covered with wooden panels. A MKII all the way from France on some Votex wheels that had been designed by F.A. Porsche. The Corrado is a car that doesn't get a lot of love. Is it because they are hard to find? I don't know but I do know I have one very cool example ready for you in a forthcoming spotlight. A classic MKI on golden Ronals. This blue convertible from Germany looked very good even in the rain with it's cover closed. Get ready for a few spotlights on some of the cars that really stood out to me. There is no such thing as Mercedes Exelero, its Maybach. what's that on the hood of the rusty golf? The wheels on the MKV GTI are Maybach Exelero based, not Mercedes. Just thought I'd tell you. Two years ago I would've been all over these VW's, but as time passes they really are very boring cars. Same wheels, same stance, same oem+ styling and chances are with the same 1.8t engine conversion. Its just boring as hell really. If you ain't rubbin then you ain't dubbin. srsly worst trend I have ever seen, can't stand vdubbers. 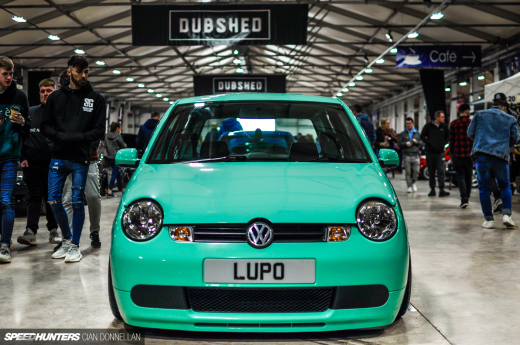 The VW scene is like a train wreck. It's horrifying, but at the same time you somehow can't look away. Cool cars.. im happy that rusty look is dying ..lol i didt like it anyway. But a car i want to see get feature here is the Opel Calibra!! i know is hard to find a good one that hasn't been pimped out with stupid spoilers and stuff. but i think there should be some cool example out there. Dusty.. train wreck? Nice wheels, nice drop, nice paint.. what am I missing here..? I love the Mk5 on Alphards. 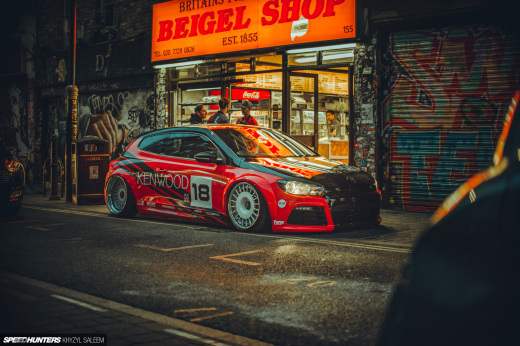 Those wheels just work on the later Golfs. 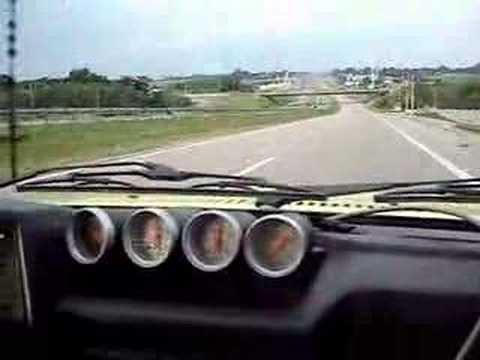 vw's do get a little boring after a while... but then again what eco box car doesnt? all the hondas look pretty much the same... still have yet to find a community as chill and as fun as the vw community. 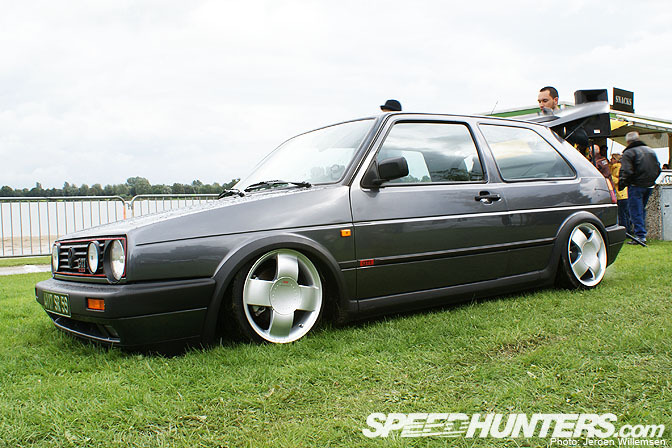 I've never seen the four-spoke Votex rims on that mk2 GTI! so unique and different! love the Corrado for obvious reasons.. not a big fan part panel rust - sorry! 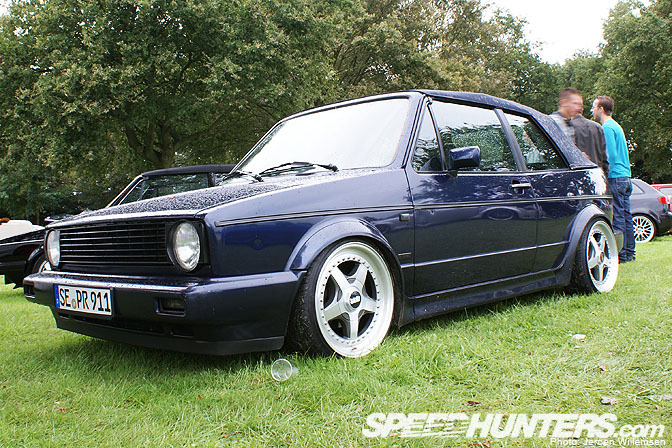 nice MK1 G60.. classic - pics are great!! bring on the Corrado.. i can't wait!! If it weren't for the plates and the fact that no one is wearing girl's jeans, it could be the east coast of the US. Hi, big thanks for the great compliment! As mentioned, Alphards are from the SL500, not Maybach.